Advancements in technology have always had major impacts on medicine. Increased use of smartphone and related software applications has created a new era in clinical data exchange among patients and clinicians. 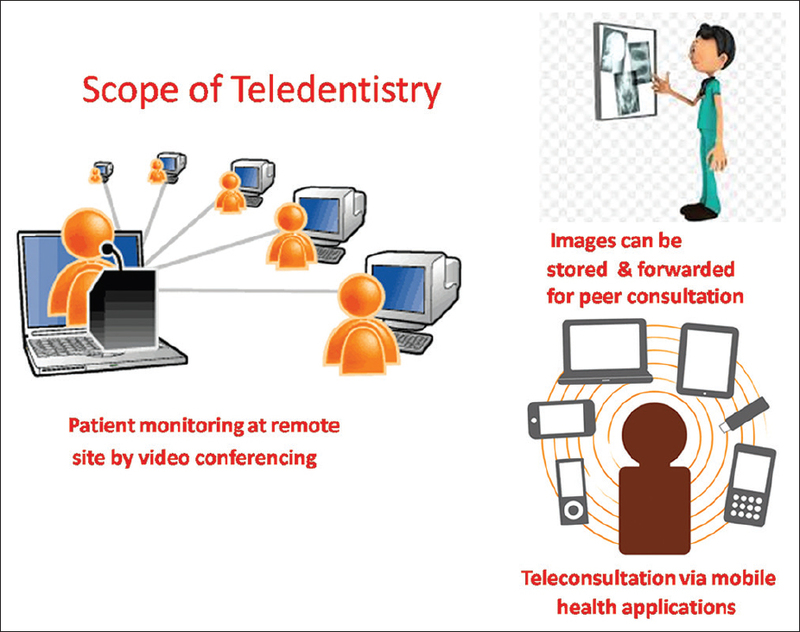 Teledentistry is a combination of telecommunications and dentistry, involving the exchange of clinical information and images over remote distances for dental consultation and treatment planning. It has the potential to address many of the problems related to access, cost efficiency and quality of dental care. Through teleconsultation with specialists in larger communities, a dentist in a nearby community can provide access to specialty care for their patients easily. Teledentistry can extend care to underserved patient populations, such as those in rural areas, at a reasonable cost. This review article aims to emphasize the importance of teledentistry in various specialties of dentistry and its role in serving the underserved population. Oral health is an integral part of general well-being. Technical advances in dental care have documented early diagnosis, preventive treatments and early intervention can prevent or reduce the progress of most oral diseases. Racial and ethnic minorities, people who are mentally or physically challenged and those from low-income families, particularly children, are especially hard hit due to decreased access to dental care. In most rural areas, there are many barriers to dental health care, including geographic remoteness. High altitude areas and the low lying areas which are not connected with metro cities, adverse weather and road conditions, poor public transportation, poverty and lack of health insurance, a low number of dentist relative to total population and scarcity of specialty and subspecialty dentist cause a hindrance to dental care. There are plenty of techniques emerging every day and as the technology is advancing these problems can be overcome. Telemedicine, being one of the recent techniques, enables the patient to consult the doctor with the help of photographs and e-mails. It gives an added advantage to the patient, as the patient can consult a specialist who is available at a remote site, thus saving time and energy. Internet and technology has made the world a small place. Although people are geographically far away, they are well connected through social media and other mobile applications, which can be accessed anytime and anywhere. Teledentistry can thus become a very simple tool for solving complex medical and dental problems. Teledentistry is defined as “the provision of real-time and offline dental care such as diagnosis, treatment planning, consultation and follow-up through electronic transmission from different sites.” This article aims to review the scope of teledentistry with emphasis on subspecialties of dentistry. Technological innovations and high-speed internet network can be applied in the field of medicine and dentistry. In this new era, teledentistry which is now in the budding stage can prove to be of great help for the underserved patients. 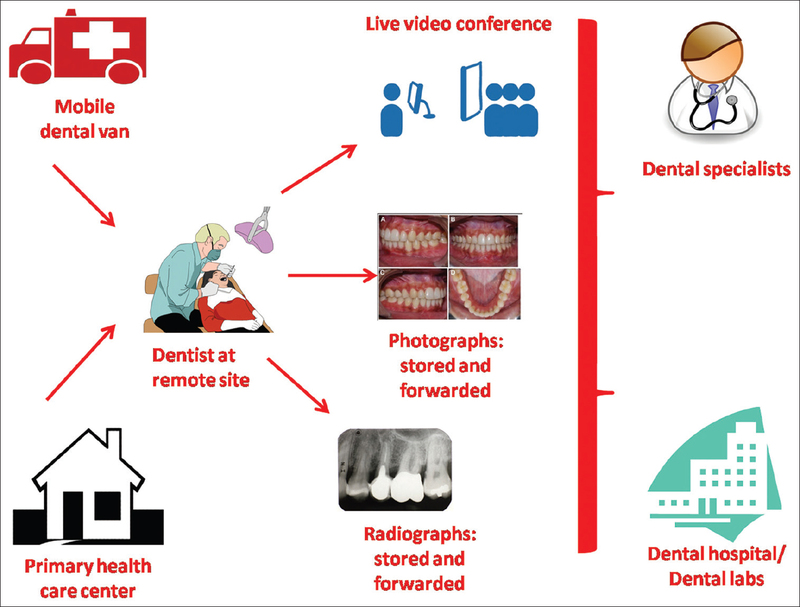 Teledentistry can take two forms: (1) real-time consultation and (2) store and forward [Figure 1]. Real-time consultation involves a video conference in which dental professionals and their patients, at different locations, may see, hear, and communicate with one another actually using advanced telecommunication technology and ultra-high bandwidth network connections or satellite., For a typical teledentistry visit, special video conference equipment, intraoral camera with high resolution and a video/internet connection are setup at both hub site and remote site. Store and forward, on the other hand, involves the exchange of clinical information and static images collected and stored in the telecommunication equipment. In store and forward, the dental practitioner collects all the required clinical information and intraoral and extraoral images and digital or scanned radiographs and forwards them for consultation and treatment planning through established networks and/or the internet. Thus, the treatment is provided in a far more timely, targeted, and cost-effective manner. The scope and advantages of teledentistry are as follows [Figure 2]. Teledentistry has been found to be extremely beneficial to elderly people. As a result, the majority of this group of patients can avoid hospital based treatment entirely and need for expensive transport. Furthermore, there is significantly reduced accompanying staff time and patient's anxiety. The initial setup cost of teledentistry equipment is high, but this is a one-time investment, and the cost is negligible later on. The cost saving of teledentistry is greatest in the remote communities as the need for expensive transport is also avoided. Mobile phones with various web-based applications can prove to be the simplest means of forwarding images for teleconsultation with absolutely no extra cost. Recently, there have been many mobile applications coming up for the common man for their general and dental health, which they can access round the clock without an extra expense. Teledentistry may help in early diagnosis, and preventive treatment, for example, early diagnosis and proper management of precancerous lesions helps to prevent a lesion to turn into a malignancy. In addition, carious lesions can be detected at an early stage by this method and proper treatment can be planned for the patient. As the travel time for the patient is greatly reduced, and accessibility of specialist is almost within a few minutes, there is a substantial reduction in time. Preauthorization and other insurance requirements can also be met almost instantaneously online, with the use of real images of dental problems rather than tooth charts and written prescriptions. All images can be reviewed within few minutes of receipt and patients can be contacted within 2–3 h of image review and can be invited to undergo an oral mucosal examination later if required. With the help of teledentistry, the patient can receive the medicinal treatment without even traveling to a specialist at far areas. However, the patient should be asked regarding drug allergies. In case, the patient is not recovering, he/she should visit the specialist personally. Teledentistry involves sending of clinical images or audio files to a colleague to compare opinions and peer consultation which can often lead to better prognosis. It also enhances the communication between the dentist and laboratory personnel. The enhanced communication leads to early, correct and swift management of oral pathologies, thus enhancing patient's quality of life. Information regarding patient detail can be stored in computers and mobile phones for record purposes and this data, if required can be further transferred to a specialist for diagnosis and treatment planning. These can be accessed anytime, and their records can be sent for a second opinion from specialists. This further saves the time of the specialist and the patient. It can also help in solving criminal cases with the help of forensic dentistry. Stored data can also be used in various retrospective studies, cohort studies, and surveys. It is seen that there is a scarcity of specialists in remote areas. For this, we need to train the dental team at remote site because specialist cannot perform hands-on examination thus leading to enhanced training of dental personnel. Nothing can match the accuracy of the diagnosis of the patient performed clinically. In teledentistry, the various steps of diagnosis cannot be performed, palpation and percussion being the most important ones. Teledentistry may only help in the preventive and diagnostic procedures. For nonmedicinal treatment, the patient has to visit the specialist for clinical work such as restorations and surgical procedures. It can be time consuming for the specialist and patient, as the process of procuring digital photographs of an oral lesion, transferring photos to a device connected to internet and forwarding the picture as an attachment to get a diagnosis requires expertise and knowledge of technical details. Technical snag and poor network can lead to delays in teleconsultations. The initial cost of equipment is really high. For instance, to capture high-quality images, a special intraoral camera or digital camera is required, and high-speed internet is also required which increases the cost. Diagnosis is based on the clinical photography that may change on face-to-face communication. The accurate display on intraoral photographs or video recording may be different than what is present actually. Additional diagnostic aids such as percussion and palpation cannot be performed. Specialists cannot perform hands-on examination. He/she has to rely on the examination performed by the dental team at the remote site; therefore, there should be a good relationship between dentist working in remote area and specialist. Telemedicine and teledentistry also raise concern about the confidentiality of medical and dental information. Therefore, an informed consent should be taken from the patient and the patient should be made aware about the inherent risk of improper diagnosis or treatment due to the failure of technology. Technical problems occurring during data transmission may cause a misdiagnosis or medical error. Issues of responsibility and malpractice need to be considered. Licensure of teledentistry practice largely depends upon the country definition of teledentistry. Most of the teledentistry-based education programs are in English. Since the internet is a worldwide tool, future goals should include consideration of more multilingual programs. Where and How to Use Teledentistry?? Technologic innovations in the field of dentistry have been extensive in recent years. Most important have been seen in oral and maxillofacial radiology which includes the use of digital diagnostic imaging services, digital radiography, intraoral cameras, and many other softwares which have not only drastically improved the quality of management of dental patients but also led to many advancements in various branches of dentistry. Minor emergencies such as rubber ligature displacement, irritation due to orthodontic appliance can be solved by telecommunication in the field of orthodontics, thus limiting visits to the dental office. Orthodontic specialists, after taking dental impressions of the jaws, instead of casting jaw models in plaster can send the impressions by special postal service to specialized companies for three-dimensional (3D) digitization of working models; then, they create digital 3D models and return it through internet to the therapist. The therapist can share this digital model of the jaws with others through network, effectuating necessary consultations with his colleagues. Peer teleconsultants, if required, may also participate from a distance in the creation of a plan and program of orthodontic management, using digital patient model. Teledentistry based on the internet as a medium for distant communication enables its use worldwide, reducing the costs of management and increasing the availability of urgent help to all patients. Baker et al. have also demonstrated that there is no statistically significant difference in the interpretation of periapical lesions between the images viewed locally (using a viewBox) and images transmitted through a video-conferencing system. Prevention and early detection of caries are the key factors in the suppression of this mass disease. In addition to its basic role in providing dental screening in distant, rural, and other inaccessible areas, the method of teledentistry has been demonstrated as a high-quality alternative in children afraid of dentists, reducing their fear and anxiety compared to clinical examination in real time. The technological development has been at its highest level in computerized radiographic support in dental implants placement, where it is possible to observe the patient in one part of the world, and in the other part make a digital project of the complete implant and prosthetic construction. Occasionally, communication is required between the dentist and the laboratory technicians for various cases submitted for fabrication of prosthesis. In such cases, colored images of the patients' teeth can be sent for shade selection, size, shape, and contours of the prosthesis to be fabricated. Computer-aided design (CAD) and computer-aided manufacturing systems are gaining precedence in the manufacturing of individual dental crowns, dental inlays, and onlays, over traditional hand modeling and casting of prosthetic reconstructions. Since there are dentists and dental technicians who are not very skillful doing this somewhat complicated process of designing shapes and inter-jaw relationships using CAD softwares, the usual practice is to request the help of computerized dentistry specialists with the use of teledentistry. Digital impressions are replacing conventional impression techniques where the jaws are scanned and sent as a computer file to the dental laboratory for fabrication of the various prosthesis. Since digitization of data is required in teledentistry, the data are stored and can be used retrospectively. It can thus help in solving criminal cases related to forensic dentistry. Stored data can also be used in various retrospective studies, cohort studies, and surveys. Oral lesions can be electronically photographed using a 50 mm macro lens and circular illumination system, and clinical data can be stored in a textual file. Specialists of oral medicine can then analyze independently the obtained images and clinical information. They make the diagnosis and electronically return the results. This approach is able to produce good results, which could be further improved with the use of a comprehensive electronic patient history, containing the complete history of all current and past diseases, medications taken, diagnostic and therapeutic procedures and recorded all other factors of influence on the status of the currently assessed lesion. Therefore, in cases of orofacial disorders such as oral cancer, temporomandibular joint disorder, oral mucosal diseases, salivary gland disorders, orofacial pain disorders, and infective orofacial lesions which require immediate attention, the role of remote consultation can prove to be a boon for the patients. Belfast in N. Ireland has successfully proved that distant diagnosis is an effective alternative in the diagnosis of oral lesions using transmission of digital images by E-mail in oral medicine in a community dental service. The diagnostic assessment of impacted third molars by the telemedicine approach was equal to the real-time assessment of clinical diagnosis. Aziz and Ziccardi reported that smartphones provide fast and easy access to electronically mailed digital images and the oral surgeon is not restricted by the constraints of a personal computer. OralCDx is a method for screening oral lesions that involve a brush biopsy and computerized analysis of the histologic slide, allowing for screening of patients for premalignant or malignant lesions. These tools help to consult an expert or specialist through the available telecommunications channels. Even beyond general indications for telemedical approach in clinical setting and with the presence of specialists, the significant need for adequate consultation with a colleague of the same or different specialty may exist. Digital radiology is an application providing films that are equivalent to traditional films for many diagnostic and therapeutic tasks. In addition, it has the advantages of reduced radiation exposure for patients and dental personnel. Both clinical and radiographic diagnosis is necessary to reach a final diagnosis. Intraoral, panoramic radiographs, sections of cone beam computed tomography (CBCT), CT, and magnetic resonance imaging can be transferred to a specialist through internet for consultation also termed as teleradiology [Figure 3]. Images can be transferred to the specialist for peer consultations and second opinions from remote areas, thus saving a lot of time and obtaining an accurate diagnosis. 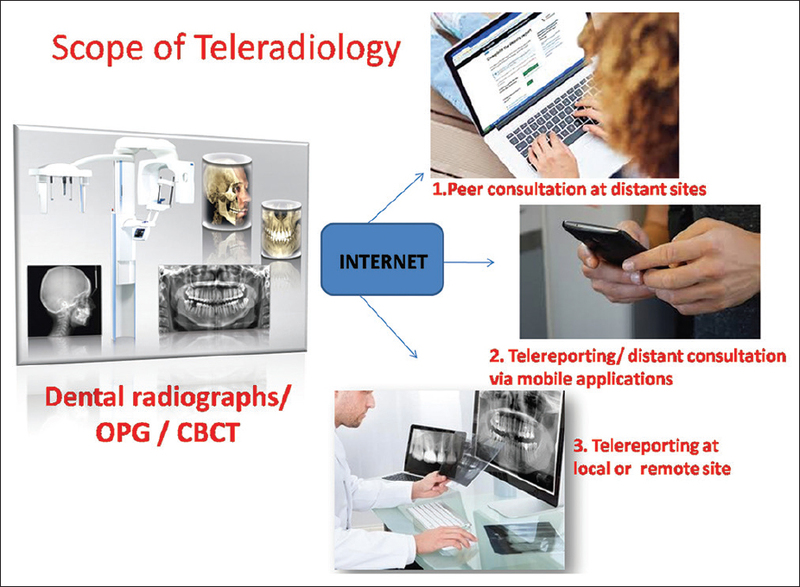 Dental insurance authorization, maintenance of records, retrieval of records and for forensic purposes and continuing education are the other potential application of teleradiology. It is evident from the literature that most dentists are unaware of what teledentistry is, what its goals are, and how they can get involved in it. In dentistry, there are fewer specialties than in medicine, and the number of general dentists and dental specialists per person are low. This implies the urgent need of using resources, i.e., dental professionals, most effectively and efficiently. Teledentistry is a new field that has a significant potential for supporting clinical care and for dental education. Thus, teledentistry involves consulting experts using the Internet, i.e., teleconsultation. Fricton et al. in their preliminary testing and evaluation of the system revealed that the average rating of teledentistry in meeting a patient's goal for a visit is 9.1 (with 10 being the best possible). Torres-Pereira et al. have also shown an effective distant access to oral lesions and benefits of the use of E-mail services and a store-and-forward image system. According to a study conducted by Oral Medicine Department, University of California at Los Angeles, the E-mail was considered to be best for exchanging ideas, disseminating the latest scientific information and discussing the potential diagnosis. Dental consults is a web-based consultation system used by dentists. The referring dentist can log into a secure web server, fill in the patient details, specific reasons for consultation, chief complaints, and provisional diagnosis information and can upload intraoral images as well as dental radiographs. In addition, teledentistry has the potential for education and self-education too. Respondents, especially those involved in education, reported that teledentistry would be good for dental education over the internet and for training primary care dentists online. Teledentistry can be a valuable tool for long-distance continuing dental education programs like webinars. With the use of teleconferencing equipment, educational lectures can be broadcasted to a remote site. Teledentistry is a new area of dentistry that integrates the internet to improve the access to care for patients in remote settings. Future advances in technology will enable teledentistry to be used in many more ways other than the conventional means. Light-field-based 3D Telemedicine could be the next generation cutting edge technology in teledentistry. Light field photography enables recording light rays in a single shot and provides 3D glass-free display with a wide zone of viewing. This provides an immersive 3D display and highly detailed convertible algorithm with all the important details of the patient/case for the doctor and health professionals. Teledentistry works best in the field of oral medicine and radiology as teleconsultation and teleradiology are the most feasible options through teledentistry. Although face to face patient examination is still considered to be the most accurate in establishing a correct diagnosis for oral mucosal pathologies than transmitted descriptive patient data alone, some recommendations can be considered for improvising the teledentistry experience, especially in the field of oral medicine. Research aimed at evaluating the cost-effectiveness of using a community-based teledentistry service for the management of oral mucosal disease, in comparison to the traditional consultant led hospital based approach, should be undertaken. Telemedicine and teledentistry includes a growing variety of applications and services, including two-way video, E-mail, smartphones, wireless tools and other forms of telecommunication technologies. Although this form of teledentistry is not error-free and has medicolegal implications, it has the potential for facilitating faster diagnostics or therapies and often lead to better prognosis. In rural areas, where there is a shortage of specialists, the lack of comprehensive and sophisticated health care is a problem. Teledentistry can extend care to additional patient populations at a reasonable cost, as well as ease the problem of shortage of specialized dental consultants and professional isolation in rural areas. American Dental Association. State and Community models for Improving Access to Dental Care for the Underserved – A White Paper. Chicago: American Dental Association; 2004. Fricton J, Chen H. Using teledentistry to improve access to dental care for the underserved. Dent Clin North Am 2009;53:537-48. Chen JW, Hobdell MH, Dunn K, Johnson KA, Zhang J. Teledentistry and its use in dental education. J Am Dent Assoc 2003;134:342-6. Subramanyam Venkata R. Telepathology: Virtually a reality. J Med Pathol 2002;1:1-15. Currell R, Urquhart C, Wainwright P, Lewis R. Telemedicine versus face to face patient care: Effects on professional practice and health care outcomes. Cochrane Database Syst Rev 2000:(2):CD002098. Rocca MA, Kudryk VL, Pajak JC, Morris T. The evolution of a teledentistry system within the department of defense. Proc AMIA Symp 1999:921-4. Shirolkar R, Ruparelia KP, More C, Ruparelia P. Teledentistry; an art and science of healing. J Indian Acad Oral Med Radiol 2011;23:108-11. Chang SW, Plotkin DR, Mulligan R, Polido JC, Mah JK, Meara JG, et al. Teledentistry in rural California: A USC initiative. J Calif Dent Assoc 2003;31:601-8. Bradley M, Black P, Noble S, Thompson R, Lamey PJ. Application of teledentistry in oral medicine in a community dental service. N Ir Br Dent J 2009;29:399-404. Bauer JC, Brown WT. The digital transformation of oral health care. Teledentistry and electronic commerce. J Am Dent Assoc 2001;132:204-9. Petruzzi M, De Benedittis M. WhatsApp: A telemedicine platform for facilitating remote oral medicine consultation and improving clinical examinations. Oral Surg Oral Med Oral Pathol Oral Radiol 2016;121:248-54. Sfikas PM. Teledentistry: Legal and regulatory issues explored. J Am Dent Assoc 1997;128:1716-8. Kopycka-Kedzierawski DT, Billings RJ. Teledentistry in Inner-city child-care centres. J Telemed Telecare 2006;12:176-81. Eby A, Sanju L, Shilpa C, Abraham K. Teledentistry in practice – An update. IOSR J Dent Med Sci 2016;15:103-6. Mihailovic B, Miladinovic M, Mladenovic D, Lazic Z, Jankovic A, Zivkovic D, et al. Computerized Dentistry [In Serbian]. Belgrade: Obelezja; 2009. Zivković D, Tošić G, Mihailović B, Miladinović M, Vujičić B. Diagnosis of periapical lesions of the front teeth using the internet. PONS Med J 2010;7:138-43. Baker WP 3rd, Loushine RJ, West LA, Kudryk LV, Zadinsky JR. Interpretation of artificial and in vivo periapical bone lesions comparing conventional viewing versus a video conferencing system. J Endod 2000;26:39-41. Mihailovic B, Miladinovic M, Vujicic B. Telemedicine in dentistry (Teledentistry). In: Graschew G, editor. Advances in Telemedicine: Applications in Various Medical Disciplines and Geographical Regions. Rijeka (Croatia): InTech; 2011. p. 215-30. Späth C, Kordass B. Optimization of the static occlusion by “occlusal surface settling” in the cerec 3D software. Int J Comput Dent 2006;9:121-6. Torres-Pereira C, Possebon RS, Simões A, Bortoluzzi MC, Leão JC, Giovanini AF, et al. Email for distance diagnosis of oral diseases: A preliminary study of teledentistry. J Telemed Telecare 2008;14:435-8. Aziz SR, Ziccardi VB. Telemedicine using smartphones for oral and maxillofacial surgery consultation, communication, and treatment planning. J Oral Maxillofac Surg 2009;67:2505-9. Ata SO, Ozkan S. Information Technology in Oral Health Care: Attitudes of Dental Professionals on The Use of Teledentistry in Turkey. European and Mediterranean Conference on Information System; 2009. Younai FS, Messadi DV. E-mail-based oral medicine consultation. J Calif Dent Assoc 2000;28:144-51. Joshi VK. Teledentistry: Tackling issues of confidentiality on the internet. Dent Mag Artic 2002. Wang G, Xiang W, Pickering M. A cross-platform solution for light field based 3D telemedicine. Comput Methods Programs Biomed 2016;125:103-16.